Do you ever walk by your child’s room and get upset because of how messy it is? Do you ever wish they were cleaning instead of playing? Ever just shut the door and walk right past it? There may be affiliate links in this post. Please read my policy on affiliate links(here)if you want. I truly believe less is more. This game is to help kids have fun cleaning their room. I highly recommend going through their toys if you help them and teach them how to throw away the broken toys or donate toys they no longer play with. I’ve read many books and blogs along the way that emphasizes that children use their imagination more and have more fun when they actually have LESS toys. It’s definitely worth a try. Keep reading to learn how we now get the kids to clean their own spaces. I came up with the Grid Cleaning Game one day after months of having my son’s room a mess. You see we took away some things and tried to get him to clean his room by himself. He is 9. He knows where things go, but he didn’t know where to get started. My son ran an errand with me one day and this game came to me. I talked it out with him in the car and before I could shut my door he was running inside to play. We played this game together for 2 rounds and by the time his dad got home 50 or so minutes later his room was 80% better. 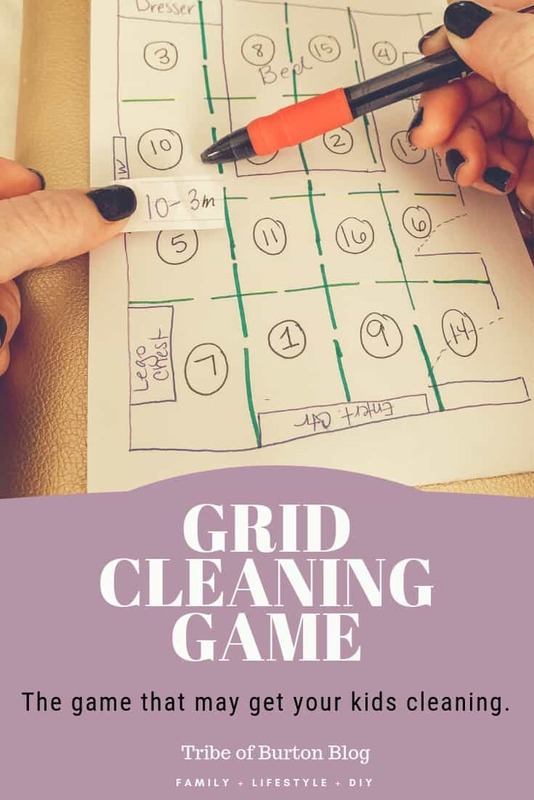 Who is ready to learn what the Grid Cleaning Game is and how it may just help you and your kids clean up time be a little more fun? I even got him on the planning phase. I promised to help do 2 grids or rounds with him. It got him excited! You can always visit my Amazon Storefront to see organization items I recommend. Click here. Step 1: draw your child’s room on a piece of paper. Like a floor plan. See my sketch below. Step 5: set a time limit. We used 60 minutes. He’s 9. He doesn’t last much longer than that in one sitting. Step 9: draw a piece of paper. If it says 4-3 min. Set a timer for 3 mins and go to grid 4 and begin!! ***as always I have 3 bags with me. One for garbage. One for donate. One for another room. Either garbage bags or these bags. For the kid’s room I add a 4th bag for dirty clothes. We did 2 grids together. As fast as we could. He was so excited. Then his big sister wanted in on the fun. So she ended up wanting to play the game with him too. Then she did her room and he was excited to tell his daddy about it. For a child that day dreams a lot and sometimes (okay all the time) lacks motivation to clean his room. The Grid Cleaning Game really got him excited! Click here for Week 1 of our grown up challenge. Week 2 comes out tomorrow. Also you can read about letting go of household items in this book here. If you have any questions, Comment below! I would love to hear your thoughts!